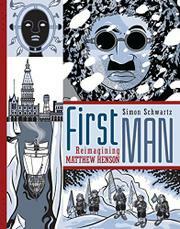 A fictionalized account of the life of Matthew Henson, the black American who reached the North Pole before Robert Peary, told in graphic form. While history has credited Peary with the discovery of the North Pole, it has largely forgotten his companion, Henson, who not only participated in Peary’s polar expeditions, but actually arrived at the North Pole hours before him in 1909. Henson notably forged connections with the Inuit and inspired the figure Mahri Pahluk in their stories. Schwartz attempts to rectify this oversight with his highly laudatory retelling of Henson’s life. Though he draws upon historical reports as well as Inuit legends, he also takes considerable artistic license with some details, eliding some less-flattering ones. A chronology at the end of the book helps clarify the historical record. Bold artwork in a cool palette of white, gray, black, and pale blue will remind readers of Marjane Satrapi’s. Some illustrations feature a highly abstracted style reminiscent of Inuit art, while the other, more-realistic drawings often shift subtly between time periods. The panels featuring the older Henson are almost entirely silent, reflecting how his achievements were largely suppressed by Peary’s fame.